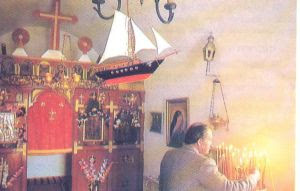 In the Church of Saint Andrew the First-Called in Spetses there is a silver ship hanging from the ceiling, which testifies to a naval miracle of St. Andrew that happened on November 30th of 1898. The following story is related to us by Peter D. Argyri. It was the dawn of St. Andrew's on November 30, 1898. Most homes on the island of Spetses were lit by oil lamps. Housewives were getting ready for church to celebrate the feast. Outside there was a bitter cold, as a storm had swept through the night before. Despite the bitter cold, at eight in the morning the church was crowded with the faithful. As the priest was in procession with the Holy Gifts during the Great Entrance, all eyes turned towards the door. A bunch of bearded, shabby, soggy, disheveled men came in led by their captain. They approached the icon of St. Andrew and knelt together, first the captain followed by his crew. At one point even the priest stopped chanting to watch. Their faces seemed wild, cold and pale. The salt of the sea or possibly some great agony carved deep wrinkles in their foreheads. Their hair was glued to their heads mixed with the blood from their wounds. Their clothes were ragged, and from the holes in their pants and shirt one could distinguish wounds that had been covered with dried blood. The captain, after crossing himself and resting his head on the floor, pinned his eyes upon the icon of the Saint. His eyes were filled with tears and he trembled all over. With a quick movement of his hand to his bosom he pulled out a pouch so full that it was about to break from all the coins, and he placed it before the icon of St. Andrew. The sailors did the same, kneeling and kissing the icon with reverence. "Commune us all, my Father, though we have never fasted." "The sick and the traveler have no sin, my child." So he offered them Holy Communion, saying: "The servant of God..."
"...John", said the priest, "in the name of the Father, the Son and the Holy Spirit", and he communed him. He did the same to all the sailors, who also kissed with reverence the Holy Chalice and the hand of the priest. "Captain, you would give me great joy if you came with your crew to my home so I can offer you some coffee. I celebrate today." "Thank you, my Father. I will come with joy, since we havn't seen our home for fifteen months now." Soon everyone filled the house of the priest and the priest's wife took care of them all. Upon discussion the captain began to chronicle how his ship landed on the island. "We set off from Malta with my friends here 35 days ago. On our way we came upon inclement weather. My ship is forty yards with two masts and they received several shots by the wild waves, but that which happened for three days and three nights I have never encountered in my life. The waves even covered the masts. At one point a huge wave cut the mast like a cucumber and it was swallowed by the sea. The waves were hitting us like balls, from the left and the right, as we tried to hold the ship. Some were wounded, others traumatized, and would moan and beg the Panagia and Saint Nicholas to help us. Last night as night came, lightning and thunder and furious wind whistled against the ropes as if they were sirens, and we couldn't even see our noses. 'Courage, my lads, courage that we may endure' I yelled. 'It is a shower and it will pass.' We did not know whether we were in the sea or on the ship. The ship was taking in water. To the right a hole had opened. 'Help, Saint Nicholas!' I hopelessly yelled. In a moment, a huge wave grabbed me and threw me to the corner. It broke my ribs and I was barely able to discern through the bright lightning a certain monk, just like you Papa George with the black cassock, holding the wheel. I do not remember anything else, my Father. But that monk was the same as St. Andrew whom we celebrate today." "After, my Father, we heard in the mayhem the voice of the captain tell us: 'Crash, crash children....' No one responded. We only said to ourselves that the captain had gone crazy. And we shouted to him: 'Have you gone crazy, Captain? Where can we crash in the sea?' He said again: 'Crash in the front!' We obeyed and crashed. Silence spread around us as if everything became calm, and we thought a miracle happened. 'Captain, Captain!' we cried as we searched for him among the wreckage. We finally found him wedged between some planks. He couldn't remember anything." "Saint Andrew saved you, my children. And you who were night and day at sea amidst many dangers must have Christ within you." "They took me, my Father, and lay me on a blanket. We had no light, pitch darkness, and we waited for God to bring the dawn of day, since we imagined to be at some port. When we began to distinguish the white houses on your island, a good child came by at the beach, and having asked him what place this was, he said it was Spetses and the feast of St. Andrew. It was him that grabbed the wheel and gave orders to my sailors. We had left Malta and went to Crete and after to Chios. But who would have imagined that weather, the Saint, would bring us to your island. With the coins we left at the icon of the Saint, help the orphans, the widows and the poor. It was fifteen months of fares. Money I can gain again, but my life and that of my sailors never. I will return to your island and hang, by his grace, a silver ship, similar to mine." The priest blessed them, and all got up to leave, wishing them good travels, and they left towards the ship, to continue along what was set for their fate. Source: περιοδικό ''Νεανικοί Προβληματισμοί''Ιουλιος-Αύγουστος 1997. Translated by John Sanidopoulos.